The premise of Anthony Bourdain: Parts Unknown has always been easier to swallow if you’re an omnivore—the man loves meat and, shockingly enough, is usually able to find some cooking no matter the location into which he’s airdropped. 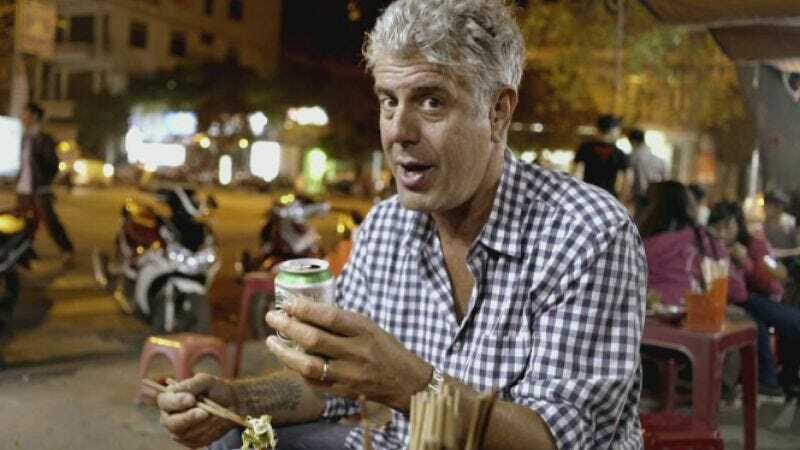 But Bourdain doesn’t just dine and dash; he and his crew interview the chefs and locals about food sourcing and preparation, which sometimes means getting an eyeful of what normally happens behind closed abattoir doors. And if that’s not your thing, you can just skip his show. But the “plethora of slaughter images” on Parts Unknown has just landed Bourdain in hot water—there’s an online petition to cancel his show. Please tell CNN and Anthony Bourdain that we will no longer be subjected to his Grand Guignol of gore, violence, cruelty and suffering of animals. By signing my petition, you will send a message to heartless executives that animal slaughter and the resulting agony must never be glorified or used as entertainment. Thank you for all who have a heart of human decency; your signature is much appreciated. Wade’s petition has almost reached its goal of 18,000 signatures, though we’re not entirely certain what will happen once that final supporter co-signs. Perhaps Bourdain will have to do some kind of meat offsetting, or eat a Boca burger for every third or fourth meal. Or maybe, because Bourdain is essentially documenting the preparation of food—including meat—in other cultures and not pushing its consumption on them like some kind of meat missionary, CNN will just let this one slide.